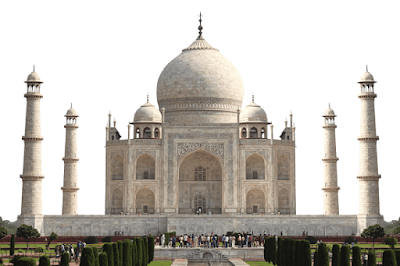 We already know little bit about the Taj Mahal, but here we talk about some interesting facts and history about the Taj Mahal - Seven Wonders of the World. The Taj Mahal was built by Shah Jahan in the memory of his wife Mumtaz. It was built in 1632-1653. It was estimated that 32 million rupees (in today’s currency) was spent on construction. 28 Different types of precious and semi-precious stones were used, some of them them from different parts of India and the rest were imported from China, Tibet, Sri Lanka, Afghanistan and Carnelia from Arabia. It’s a finest piece of art work; it took 22 years to complete. Taj Mahal is India’s popular tourist destination, attracting more than 10 lakh tourist every year. The wonderful architectural design was completed by 22,000 laborers, embroidery artists, painters, stonecutters etc. It is said that nearly 1000 elephant were used to carry heavy construction material apart from Labourers. The Taj Mahal is taller than Qutub Minar. Plan your to visit Taj except Friday, it is closed on Friday for prayers. The Taj Mahal is regarded as Seven Wonders of the World in 2007 by UNESCO World Heritage. See Wikipedia for detail. Essay on Taj Mahal in about 200 words, brief description about a visit to Taj Mahal, based on the following outline. Introduction: The Taj Mahal is a historical building, it is regarded as eight wonders of the world. It stands at the bank of Yamuna. It was built by Emperor Shahjehan in the memory of his beloved wife Mumtaz Mahal. Journey: Once I went to Agra with my elder brother. We started from Aligarh at about 7 a.m. We reached Agra at about 11 a.m. There we stayed in the Royal hotel near Raja ki Mandi. The journey was comfortable. How we enjoyed the Taj: Next day we hired a taxi. We went to see the Taj. Within half an hour we reached the Taj Mahal. First of all we went round the main building. We looked it very carefully. We found it very beautiful; it is one-of-a-kind beauty. We wanted to it again and again. Graves: We had seen two graves inside the main building. They were of the King and the Queen. They were lying side by side. Death could not separate them. Around the graves there is a fine and beautiful work of precious stone. Taj in the moonlight: At the advice of guides, we decided to see the Taj in the moonlight also. At a time it was shining like a star. The water of Yamuna was very clear and shining. The whole scene was very beautiful. It is not possible to describe its beauty. It was looking like a dream in marble. Conclusion: It is piece of art. I have never seen such a beautiful building in my life. On the account of its, Agra the city is one of the most popular tourist destination globally. Foreigners come to see its beauty from all over the world. On account of it, the city Agra is also known as, one of the Seven Wonders of the World. We loved to see its beauty again and again. Essay on Taj Mahal: In the city of Agra, on the bank of river Yamuna, the Taj stands with its unique grandeur and beauty. It is tomb built by Shah Jahan in the memory of his beloved wife, Mumtaz Mahal. It is the most beautiful monument in the world and it is regarded as one of the ‘Seven Wonders of World’. It took 20 years to build and it cost approximately three crores rupees at the time when the value of Rupee was at least seventy times more than what it now. The building is made up of pure white marble and stands on an eighteen foot raised platform made of red stone. It has four tall minarets, one at each corner. A splendid white dome rises in the centre. It is 275 feet high. It contains a large central hall. The real tomb of Mumtaz Mahal lies in a small room which one can reach by descending some steps. The tombs screen and walls of this hall are all covered with inscriptions from Holy Quran. The building is surrounded by nice garden with many lawns. The lawns are laid out with cypress trees and beds of flowers. Fountains play in many places. All these add to the beauty of the Taj. The Taj looked beautiful at any time of the day, but on a moon light night, it is really a sight to see. Then it looks like a fairy palace of molten, streaming silver. The shining white marble, the beautiful garden, the black shadow and the moon-light all make it such a wonderful sight as once seen, get indelibly imprinted on mind. It is the crowning glory of Agra and every year it attracts millions of tourists from all over the world. The Taj has also been the subject matter of poets. It has been described as a ‘poem or dream in marble’. The world renowned poet Tagore wrote many poems on Taj Mahal. It is said that when Aurangzeb imprisoned his old father Shah Jahan in the Agra fort, the old emperor used to console his mind by gazing at the last resting place of his beloved queen. One who sees the Taj even once can never forget it in one’s life.